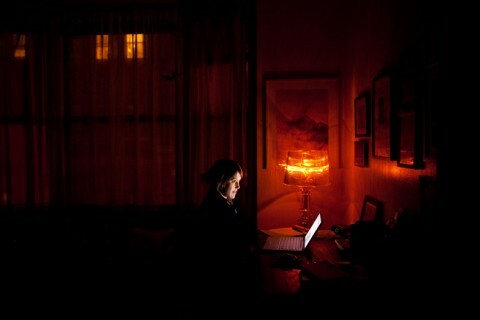 My friend Jon Huck pointed me to this photoseries by Gabriela Herman, featuring Portraits of Bloggers. Beautiful. Uau, Great! But who let her in the house so late at night :))). Ha! I had just posted a photo of my man doing just the same… except he was probably checking Facebook. Sorry to break the zombie fan girl chanting here, but what, exactly, makes this “beautiful”. And please, do not give me any of that subjective/relative eye of the beholder nonsense. What do these images convey? A blogger is an anemic, light-sensitive creature that dwells indoors, mouth agape in a gesture of jaded internet citizenry – sporting outdated Apple product? Come on people, where’s the critical thinking? Are all you all so busy pressing those damned like-buttons that you’ve all but forgotten what it’s like to actually analyse something. @Cornelius I’m guessing your not a part of the community so you don’t get it. Yes the subject matter is contextual and not for everyone but not really a reason for someone to troll as hard as you have. I also like how you managed to squeeze in a dig at Apple products, even though this post has nothing to do with it. You forgot to talk trash about hipsters, indie music and shopping at Trader Joe’s. Weak effort, not impressed. I like these photos because I relate to them, I think most blogger can identify with the feeling of solitude in your immediate surrounds while having your laptop acting as the portal to your community and working world. I think it is interesting that the new culture we have created around computers and the online world is to the point where it is being romanticized in art. 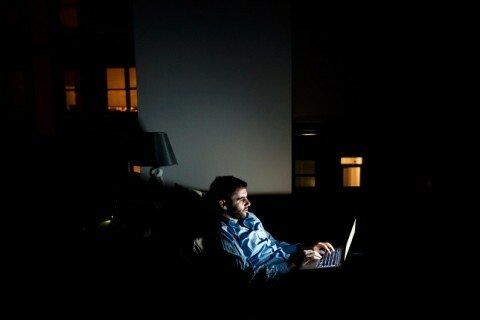 These photos represent an aspect of online culture and how bloggers see themselves. It might just be my opinion but thats art to me. @cornelius. That’s so funny and grumpy of you. harumph. I agree with both sides. The subject is kinda new, and the photos are great, but yes it is unreasonably idealistic. Though you may argue that the fact that only computer displays makes any light, or refrigerators it is kind of a critique of a lifestyle, they are lonely on those pictures, their world is that small – if you will – while chasing some kind of virtual company and attention. The pictures are wonderfully done. Love the lighting especially. I do feel a twinge of apprehension though that some people might just pick up on this series and use it to perpetuate the already widespread (mistaken and annoying) notion that blogging is not a ‘real job’. @CD I wouldn’t worry too much about that. The only people who think that are those who have never written in a blog. @Kovacs I agree these are not realistic, but it’s a photo shoot, no photo shoot is realistic. For one everyone of the subjects is wearing actual work clothes. Where are the sweat pants? If I’m not leaving the house there is no chance I’m putting on something that is going to need dry cleaning or ironing. I am glad they are idealistic and stylized, I would not enjoy looking at them if they were not. Long story short I agree with you this is a very romantic view of bloggers, but that’s what makes me like it. @concretematt But then one views the entire series on gabriela herman’s website and sees for example what may actually be an awfully realistic photo of artmostfierce at work (oh heck! LOL) or the one of the blogger with nothing but a towel on, one cannot help but think of the usual doubters who may just seize on the chance to disparage full-time bloggers as ”slackers” again. It’s like my “Source” series. Except better in some ways. Or in most ways. @ CD yeah that’s not cool. But it’s their opinion. If you feel fulfilled in the work your doing and that means you keep strange hours or work in sweat pants or don’t leave the house for a week at a time don’t sweat what others think your work ethic is. I have been self employed/contract for the last 10 years and it is something I have really struggled and needed to come to terms with. I have found you can’t worry about what people think about you, just live.